It came as no great shock to me that I was going to adore this book. I had seen the glowing reviews, and the second I mentioned that I was going to be reading Starcrossed, the comments came pouring in. Everyone was so excited that I was going to be reading what they were deeming one of their favorite books. Could it possibly live up to all the hype? Oh boy, did it ever. Brace yourselves ‘cause I am about to jump on the gushing bandwagon. 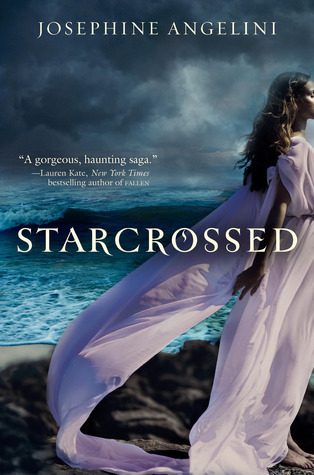 Starcrossed follows the stunningly gorgeous Helen Hamilton who is trying to lead a nice quiet life on the island of Nantucket. She was successful too… until the day the Delos family moved to the island. The first time she lays eyes on the family she is overcome by an uncontrollable rage, and one certain family member in particular triggers that rage: Lucas Delos. Drop. Dead. Gorgeous. Lucas. Helen begins having nightmares and hallucinations, and she’s hearing things. She thinks she may be going completely mad, but there is a reason behind all of it. A mystery that threatens her very existence as well as those she cares about and even these new strangers that have entered her life. A secret that will explain things Helen has been trying desperately to hide her whole life: Her incredible speed, the fact that she is freakishly strong and why she has never quite fit in. The breathtaking, tumultuous romance between Helen and Lucas as they struggle to find a way to be together is beautiful and heartwrenching. I am a huge fan of Greek mythology. It was a forbidden subject in my private Christian school, so of course, me being me, I researched and found out everything I could about gods and goddesses! Forbidden my arse. I LOVE the myths and I have copious amounts of uber love for Josephine Angelini and her incredible mesmerizing debut novel. Greek mythology, forbidden love, and Angelini’s superb, descriptive writing have me eagerly awaiting Dreamless, the second much anticipated book in the trilogy.